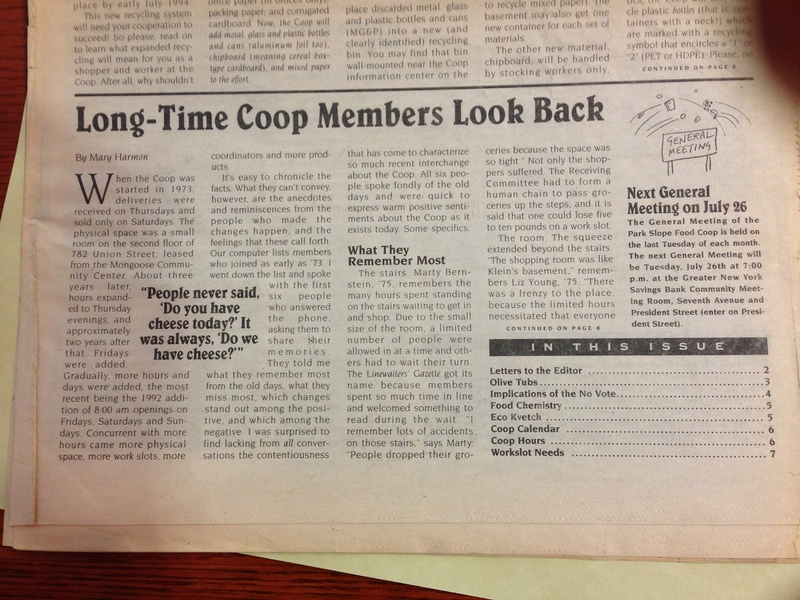 Photo of Linewaiters Gazette (the Park Slope Food Co-op Newsletter June 1994) from the Archives of the Brooklyn Public Library. The Park Slope Food Co-operative in Brooklyn NY (PSFC) is one of the largest, most interesting food co-operatives in the US. It was founded in 1973 by a small group of folks committed to healthy, affordable food. In these forty years, membership has expanded to nearly 16,000! The size of PSFC is impressive but even more impressive is the fact that all its consumer members work. PSFC members complete a mandatory 3 hour work shift every month. In fact, members who do not work, cannot shop. Many food co-operatives started with member labor, during the 70’s but most moved away from consumer-worker model. Some food co-ops provide an additional discount to members who “volunteer” but there are few if any that value and require members labor as does the PSFC. I learned of the Park Slope Food Co-op History and Education Project in April 2013. Olivia Geiger, a doctoral candidate in economics at the University of Massachusetts mentioned the project several times. She had interviewed Susan Metz for an action research project on the Solidarity Economy in NYC. Susan was looking for someone to conduct research with the PSFC and to collaborate on writing its history. The project didn’t fit into Olivia’s research trajectory so she thought of me. I was just finishing up on the VAWC book; so she argued that I would be the perfect person to do the project: qualified and available. Olivia insisted it was a fundable project so I said, okay make the connection, and she did. Metz and I exchanged emails and had a couple of meetings via Skype. We developed a proposal and she submitted a letter to the member newsletter, the Linewaiters’ Gazette, to (re)plant the seed of the project, invite interested members into the discussion and announce my visit. A prior iteration of the project had gained traction in 2011 but faded when Metz left the country. During the last week of June, I spent four days with Susan (a gracious host and collaborator!). She shared some history of the co-op and her experience as one of its active members since 1980(?). I learned a bit about the “work squad” structure and how it has evolved with the growth of the co-op and its membership. Labor hours are organized into squads of members who work in the same group each month in one of a variety of operations such as packing, receiving, stocking, inventory or administration. Susan spent some 12 years in the same work squad, Tuesday nights. Each time a new crew came on they would have a 15 minute check in with the squad leader. They would exchange info about their personal lives and as catch up on news of the co-op, the activities of the General Meeting and any glitches in the work process. At least one person from the squad would go to the meeting and report back to the group. Susan was nostalgic, she had grown close with her co-workers on the squad during those years but she was also glad to be retired. She believes strongly that work squads should have at least one person attending the general meeting (which they don’t always do). Susan has been variously involved in governance and decision-making over the years, participating as a member and running for the board of directors when she was especially passionate about a major shift in the direction of the co-op. She is interested maintenance and development of sound governing practices and structures as well as member labor and political issues around food. She was strongly opposed to the major expansion in which the co-op purchased its third building but her opinion about it has softened. Susan’s interest in researching and writing the history as well as developing an education program at the co-op is rooted in the changes PFC has experienced with its growth in scale (of membership, inventory and square footage). She was a key participant in the development of the co-op’s mission statement in the 90’s. The day after arriving in Brooklyn, Susan took me to tour the co-op. The co-op was packed. It was a hub of computers, check out registers and members busy gathering their provisions. Membership is open to all but only members can shop. So there are strict rules about who can enter the shopping area. We went directly upstairs to get a “visitors pass”. Upstairs there are more computers and a child care center to our left. Susan lead me through the offices and introduced me to founding members and coordinators including John Holtz (a founder of the co-op and general manager/coordinator who was obviously busy but welcomed me warmly) and newer staff members who were busy managing this semi-chaotic hub of community. I say “semi” because there IS order in these offices. But one get’s the sense that there is much to be done–the books, inventory, payroll… everything you can imagine that goes into managing an operation of its substantial size. There is a room that houses a multitude of computers that, I believe, were solely dedicated to coordinating work hours. After all they must keep track 16,000 members’ work shifts. If members miss one, they cannot shop! There is a penalty. If you miss one shift, you have to make up two. Most of the labor required to coordinate and monitor work hours is performed by members fulfilling their work commitments. We descended the stairs to the ground floor where a work squad was packing cheese and spices. Susan reprimanded one member worker who said he’d never been to a general meeting. After hearing her reasons, he actually agreed- “yes, I should go”. She recruited for our project another member of the squad who had a degree in anthropology. We moved on to the cramped and hectic receiving area where at least one paid staff member was managing the shipments with the working members. The paid coordinator says there’s no squad leader in this group. It’s his job. Susan was curious, “Ah…” she said “this is how work becomes professionalized.” The professionalization of labor in the co-op will be an interesting evolution to study! What is the relationship between member work slots (3hrs/month) and paid full-time staff? Susan says interesting things happen in terms of authority between staff coordinators and members. The impact of member labor on the price of goods is substantial. Produce, baked goods, cheeses, olives, everything is considerably less expensive than goods in grocery stores and co-operatives in Western MA. According to Susan, they mark food up by 20% and high end cosmetic stuff by 40%. That is compared to many stores with a 100% mark up on a lot of items. Expensive chocolates, cosmetics and lotions that I covet but can’t afford were in my price range at the co-op. For example, the shampoo I like was two dollars less per bottle. I would be staying with Susan for two more days but I couldn’t shop. So, she asked me what I wanted. I resisted stocking up on chocolates, lotions, shampoo and soaps but I did get some amazing cheese, bread and olives. Also visible–if you look–are the ethical considerations that have gone into stocking the shelves. Members have had heated debates about boycotting products from Israel, banning bottled water and plastic bags, GMOs and the like. Documenting these debates and decisions will be one of the richest parts of the history project.